I have heard confirmation from FASEN in Dakar (Senegal) that the women cooking at the ProBEC head office are using 50% less charcoal with their 'improved Malgach' stove (pronounced mal-gash). 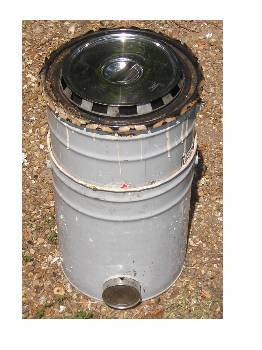 We know this as the garden variety Mali stove - a very simple metal, inverted, truncated pyramid sitting on a square stand with one side missing attached to a flat, square base. There are millions of them all over Africa. We added a door to close the open side in the stand, and another truncated, inverted pyramid to the top, creating a counter-flow air preheater. The air now only enters from below when it is being lit. There are two bricks in the base to contain heat from the grate and pass it to the incoming air. The charcoal is loaded in the usual way and lit. A metal rod bent into a triangle is dropped in and a square sheet with a pot skirt is then dropped on top of everything, closing in the fire. The rod keeps the pot off the charcoal - preferably a 50mm gap. The fact that the women are putting in 1/2 the charcoal normally used is not the end of the story. The stove is designed for 2 kg of charcoal so putting in 1 kg is leaves empty space. In reality the stove could be reduced in size by 30% in length, breadth and height reducing the material cost to approximately that of the original, larger, more wasteful stove. The gap between the two 'pyramids' is 13 to 16mm. The CF04 Stove boiled and simmered 5 liters using only 160gr of charcoal and wood. After several modifications to 4 different prototypes, it only took 150 gr of lump charcoal with 11% moisture and 10gr of wood to boil 5 liters of 83 degF/28.3 degC water in 45 min. That is 32 grams per liter to boil and simmer. At 1 hour after boiling the water was still simmering at 100 degC and after 2 hours the water was 205degF/96 degC. At this point I shut the air control and capped the pot module to stop the airflow and retain heat. At 3 hours the water temp was 190 degF/87.8 degC and was 178 degF/ 81 degC at 4 hours. 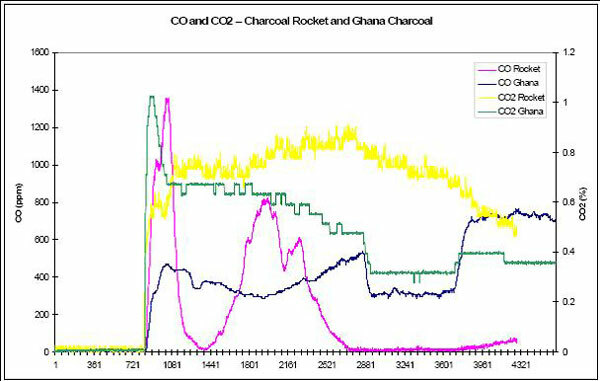 The following graph plots the levels of CO and CO2 during one test each of the charcoal burning rocket stove and Jiko-type charcoal stove from Ghana. A higher level of CO2 suggests a higher burn rate of fuel. It can be seen that even though the CO level for the rocket drops below 10 ppm, the CO2 level remains high suggesting a high firepower continues. The Ghana charcoal stove has a lower level of CO2 with a considerably higher level of CO. The charcoal Rocket Stove was compared to the Jiko-type charcoal stove sent from Ghana. 600 grams of Kingsford charcoal was placed in the stoves under the Aprovecho emissions hood. One test was performed on each stove for preliminary studies. The stoves are compared in the following graph for carbon monoxide emissions during a cooking task (to boil 5L of water and simmer 30 minutes).